As with any topic written about, each author strives to find a way to set their work apart from the flock. So it is that Francois Chaille has masterfully and exquisitely found his niche when it comes to the subjects of time, timekeeping, watches, clocks, and their continuing innovations, both mechanically and design wise. Merriam Webster offers up these possible definitions of the word time: the point or period when something occurs, an appointed, fixed, or customary moment or hour for something to happen, begin, or end, a moment, hour, day, or year as indicated by a clock or calendar or one of a series of recurring instances or repeated actions. These are taken from a laundry list of alternative meanings offered for the word time. They only vaguely hint of watches, watchmaking, timekeeping or clocks and clock making. The latter topics are what Chaille brings to the table in such a way that incorporates the history of art into all of the aforementioned possible definitions for time. The book is exquisitely illustrated and the text is detailed enough to satisfy any historian whether their expertise lies within the specialties of world history, art, or timekeeping. The context is the “hook” here, it is the book’s raison d’etre and what enables this monograph to stand apart from its relatives within the genre. 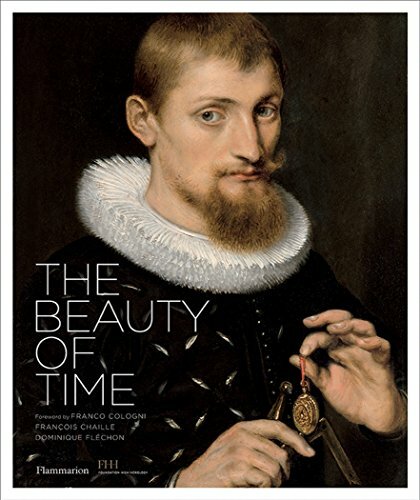 With all this said the images within the book are not just of time pieces, clocks, and the mechanics thereof but also how art figures into each historical era for the specific time frame. The text is a bit fact laden but then again it is as it should be in order to justify its writing. The gravitas comes from the research when it is conjoined with the illustrations giving the reader amazing and astounding context! One last thing is that my gut tells me this book has been translated either from French or Italian and that is why the text might appear to have a rather formal aura, but nevertheless it does not detract from its content or its ability to be understood.